Phoebe is seventeen, and isolated. Her life is under the constant threat of being discovered by the Council, and sent to the Inquisition because of her debilitating telepathic senses—a lonely life. "She'd lived numerous lives through surrogates already—experienced love and loss, passion and companionship, everything that men and women go through. But she couldn’t allow false hope for herself—love was for other people, not her." THE BALANCE is a Young Adult Science Fiction novel, set in a dystopian future. It takes place almost 200 years after a global thermonuclear war. It is the first of a three-part story. The Land is ruled by a theocracy—the Council of God—which drove the Order into exile about eighteen years before the story begins. The Order had brought advanced technology from the pre-war past into the post apocalyptic era using self-contained living time capsules. Phoebe is seventeen, and the last Sensitive to have been genetically engineered by the Order—before they were either killed off or driven into hiding. She doesn’t know why she’s plagued by the voices, images, and feelings of people all around her. For her, it’s a constant struggle just to survive the chaos they bring to her life, and to hide her strangeness from others. In the Land, strange behavior is reported, and those deemed to be witches are sent to the Inquisition. She lives in a harbor town, hiding what she is, protected by her adopted father, Daniel. The Order hasn’t completely vanished. Their ancestors had established Sanctuaries before the war, and the refugees retreated to these hideaways to survive the Purge. Now they're plotting to restore the historic agreement that made it possible for them to share the benefits of an advanced civilization with people in the Land, and to co-exist with the Council. Their leader, a genetically-engineered Prescient, is aware of Phoebe, but has largely left her alone. Now he sees danger coming for her, and he also has visions that she might hold the key to a path that would help them reestablish the agreement they made with the Council, an agreement called The Balance. The world was changing fast. Technological advances were coming so rapidly that they severely disrupted a global economy that was unable to adjust quickly enough. Worldwide recession settled in and threatened to become permanent depression. Meanwhile, these same advances also made it possible for even the poorest nations to develop lethal weaponry. Rising unemployment and financial uncertainty triggered a wave of nationalism that swept from country to country and continent to continent. Fear led to mistrust, which led to hostility. Political leaders—not knowing what else to do—did what they’d always done: they blamed problems on their political opponents, and on outsiders. A growing sense of helplessness combined with the proliferation of nuclear weapons to greatly escalate the danger of open conflict. Leaders from two separate organizations independently saw where the madness was headed, and each developed a secret plan of last resort. The Order was an ancient organization, long steeped in mysti- cism and alchemy, but over time it had evolved into a technological behemoth. Its tendrils were spread across borders and throughout the scientific and engineering worlds. As war approached, John Martin, head of the Order, directed vast resources to create what he called ‘Sanctuaries’, living time capsules intended to preserve human progress for future generations. These Sanctuaries were constructed in secret, and geographically hidden in natural underground caverns. They were equipped and staffed with the very best tools and scientists. If war came, Sanctuaries would provide shelter from the destruction. Later, the survivors would emerge to rebuild the world. For decades the Order had also been working on a set of clandestine genetic engineering programs, a long-term effort intended to improve human design by developing all new characteristics. In addition to their primary goal, each Sanctuary was also charged with continuing these efforts, collectively termed the Future Man project. Separately, leaders from the three major monotheistic religions—Christianity, Judaism, and Islam—also recognized the danger of apocalypse. They met in secret, searching for a way to stop the madness. These leaders recognized that action was needed to avert war, but that their chance of success was small. The urgent threat to human existence compelled them to abandon their customary mistrust of each other and to dedicate their combined power, influence, and wealth toward a single purpose. To that end, they formed a joint hierarchy called the Council of God. The Council ordered emergency reserves of food, water, and tools to be secreted for use after war, to save as much human life as possible. Like the Order, they hid the reserves in natural underground caverns worldwide, and assigned clergy to each location. These ‘priests’ would become the new leadership if the worst happened. The Council placed much of the blame for the coming war on two root causes: a loss of faith by the population, and the spread of dangerous knowledge and technologies. Besides saving as much human life as possible, the clergy was also given an additional charter: lead survivors to a simpler, faith-based life in the new world, and limit the spread of dangerous knowledge. They believed that a population rooted in faith and based in an agrarian economy would be far less likely to repeat the predicted destruction. The war everyone feared came and billions died. Most of the world, along with almost all of the emergency food reserves, and the Order’s Sanctuaries, were destroyed. Only the Land escaped the apocalypse. It was in the Land that two of the Order’s Sanctuaries— always built in pairs—and one of the Council’s reserves endured. Survivors from the Sanctuaries and the new Council of God leadership only learned of each other’s existence after the war, when the Order members emerged from their hiding places. The Council was suspicious of the Order, and the Order was wary of the religious hierarchy’s purpose. Still, the two groups managed to form an uncomfortable partnership and penned an agreement they called The Balance. It stipulated that the Order keep its core knowledge secret. They could provide the benefits of a modern civilization, but not disclose how the underlying technologies worked. Further, the Order was to acknowledge that the Council was senior in their arrangement, and agree to not openly challenge its leadership. The Balance forced compromise, and created a successful collaboration that lasted over 150 years. However, everything changed once the Future Man programs were accidentally revealed. These efforts had always been at the very heart of the Order’s charter, and enormous progress had been made following the war. A number of the human products from Future Man’s three programs were secretly living in cities and blending in with the population. The Council considered Future Man heresy, and a direct threat to the faith. They began taking measures to expel the Order from society in what became known as the Purge. Overnight, Order members became outcasts, and were driven into hiding, or arrested. Beings created through the genetic programs were declared demons, and rounded up for public execution. The Council warned people about ‘demons walking among us’ and advised everyone to be on the lookout for people practicing witchcraft. The population’s fear intensified when an unexpected natural catastrophe occurred. the sea, and they created widespread destruction that caused two years of winter-like weather. The threat of mass starvation created panic. Fortunately, the Council had replenished their emergency food reserve and was able to save the population, just as they had in the past. The story of The Balance begins almost eighteen years after the ‘comet’ struck. The place where The Balance takes place is that region of the world that survived the nuclear war. At the heart of the known world is The Land, the populated area that survived the war with the least damage. The Land is bounded to the west by the Western Mountains, to the north by the Great Northern River, and to the east and south by the ocean. To the south, over the sea is a series of large islands that have been populated by the survivors over the past century—called the Southern Colonies. The Western Mountains shielded the Land from destruction, beyond them—to the west—lay the Wastelands, a sloping plane that descents to an inland sea. 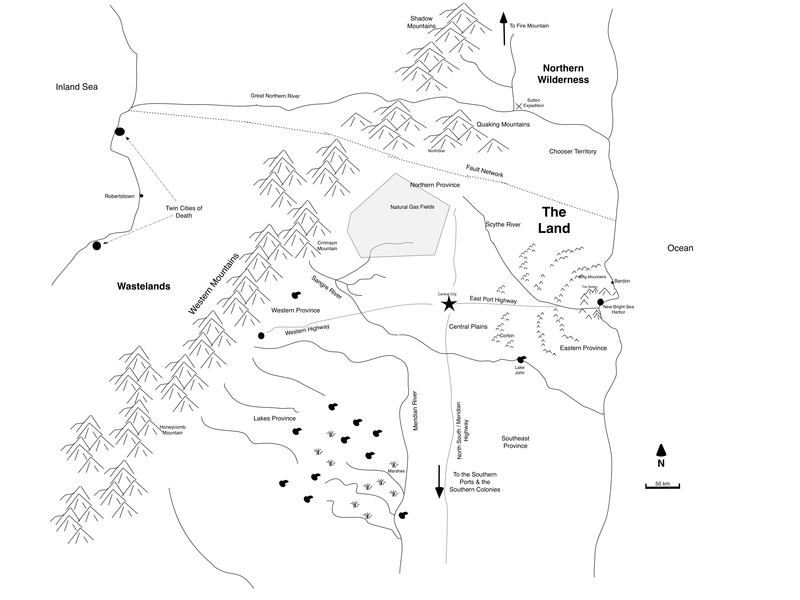 North of the Great Northern River Is the Northern Wilderness, a cold land that was never much populated, mostly forest, until one reaches the black plains, an area covered in dark igneous rock from the many historic eruptions of Fire Mountain, in the distant north. About fifty years before the war, the Order had begun its genetics project, a collection of programs intended to develop and expand human ability, and ultimately designed to change the entire global population, making people more sensitive to the needs of others, to improve overall health and longevity, and to instill a greater sense of the need to plan for the future. The intent was to create a world where war and poverty and disease would be obsolete—unthinkable. There are essentially three main Future Man Programs: the Healer, the Prescient, and the Sensitive. The Healer: the first program started and the first to yield significant results. The healer program sought to create beings with a powerful immune system that rejected disease and even mutation. The healers would be both universal blood donors, as well as universal recipients. Recent medical research has developed a drug that can cause this and I extrapolated that the genes to cause this same thing were possible. The healer can accept blood and tissue from diseased person and their immune system will generate a cure for the sick person. Their blood and certain bodily tissues then become a treatment for them. In the Land the general term for the healer is Blood Healer, although healers were also developed to be able to sense and categorize disease as well, and their saliva can be used to treat wounds. The Prescient: The prescient was developed with enhanced intelligence and the ability to "see through time". Although predicting the actual future is impossible, the Prescient can see possible futures, and their vision works in several different modes, some of which only predict patterns of behavior, while others can see every possible future for an individual, although only over a limited timeframe. This is explained more fully in the book. The Sensitive: Sensitives were developed to connect with other people telepathically, and this connectivity was further enhanced until they sometimes lost themselves in other people's lives—becoming that person. There were essentially three stages of Sensitive developed. The first stage was based on selective breeding of people who exhibited unusual sensitivity to others, as the genes responsible for telepathic links were isolated for future enhancements. The second stage—Stage 2 Sensitives—benefitted from enhancing the genes and developing new similar genes to those naturally occurring, and by selective breeding of stage 2 Sensitives. Stage 3 Sensitives continued this process, but were also modified during gestation to enhance their telepathic power and range. Their brain was altered and neural pathways were grown throughout their bodies, acting like antennae, to amplify the connection strength. There were also multiple bloodlines of Sensitives, some exhibiting additional or different abilities. By the time the story starts these had been consolidated until there were only two bloodlines left. Although I've gone to the effort to develop each program characteristic—and my unpublished backstory is much deeper with more detail—this isn't really, or strictly, a story of abilities and powers. It the story of a lost girl (the last sensitive developed, and the most potent) trying to deal with abilities she doesn't understand. Phoebe wants to be normal and she has no idea why her brain is so strange, because—by the time the story starts—she is the only remaining product of the Order living under Council rule. The Council is The Council of God, a well-meaning but intolerant society that would kill Phoebe if they knew she existed. 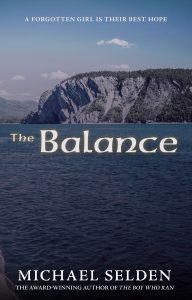 The story of The Balance would seem to pit a secular society versus a religious one, but that was never intended. Nor was either organization made up of all bad or all good people—the story is much more nuanced than this, as are most people. The Balance was always planned as a trilogy, a 3-part story. The Balance Part 2 (The Wastelands and the Wilderness) is currently under development, and—hopefully—will be ready for release in late 2019.